Hips & Berries – Dig Delve – An online magazine about gardens, landscape, growing & making. Half the hedges on the land are allowed a year off between cuts so that, on rotation, we always have some for flower and fruit. Allowed to grow out softly from the rigour of a yearly cut the fray of last year’s wood spawns sprays of blossom as the prelude to later bounty. When the hedges are still darkly limbed the stark white of blackthorn and then wild plum is forage for early bees. 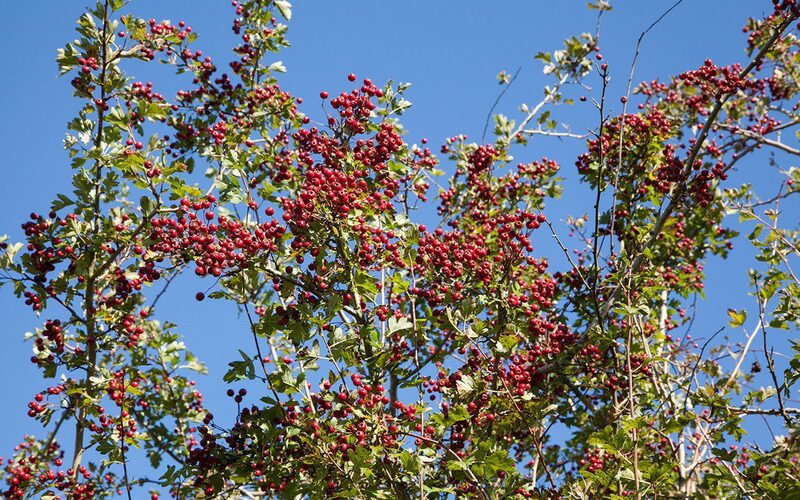 Later, freshly clothed spumes of hawthorn let you know where you have the Crataegus. This is one of the most steadfast hedge components and easily tended. Guelder rose (Viburnum opulus) follows where there is damp to sustain its particular preference, the lacy flowers like bonnets, brilliantly white amongst summer greenery. Sprays of dog rose (Rosa canina), arching free to present themselves later in June and July, start the relay between the three hedge rose species that are native. First R. canina (main image), then the Eglantine (R. eglanteria) with foliage smelling of green apples and finally the Field Rose, R. arvensis. 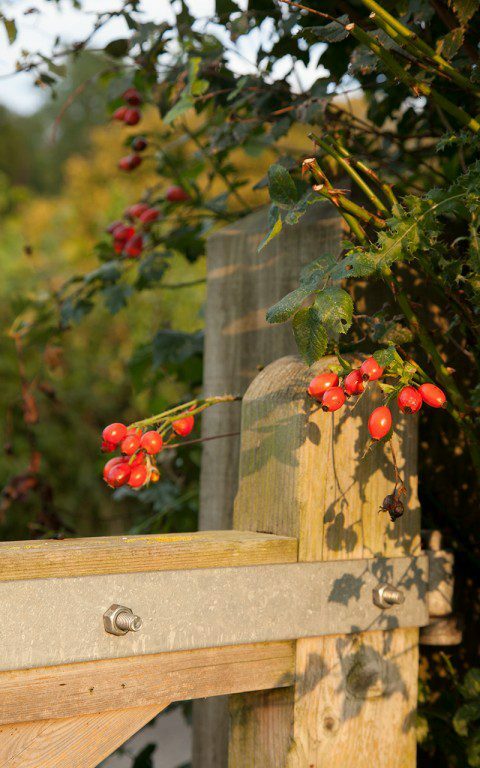 Come the autumn all of the above yield berries and hips, peppering the hedges with colour and providing feasting opportunities for wildlife. It is a vicarious pleasure to be able to contribute to this rich and connected network, linking one field with another, woods with fields beyond and shelter out in the open. When we arrived here the hedges were not in good condition. 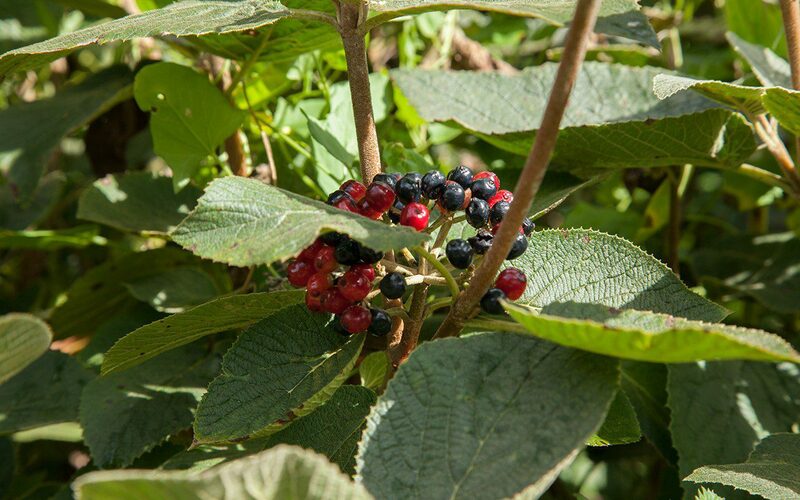 Neatly trimmed on a yearly basis, the ‘broken teeth’ (where fast-growing elder had seeded in, outcompeted its neighbours and then died) were now home to bramble. A little bramble in a hedge is not a bad thing but, come the winter, their open cages offer little protection and their advance, like the rot in a tooth, is to the detriment of the whole. Since moving here I have slowly been improving the hedges by gapping up to remove the weak sections and interplanting with new whips of fruiting species to make good the mix; common dogwood (Cornus sanguinea) and guelder rose where the ground lies wet, and wild privet, the wayfaring tree (Viburnum lantana), roses and spindle (Euonymus europaeus) where it is drier. I am happy with the hawthorn almost everywhere, but I’ve learned that the blackthorn should only go into a hedge that is easily cut from both sides. 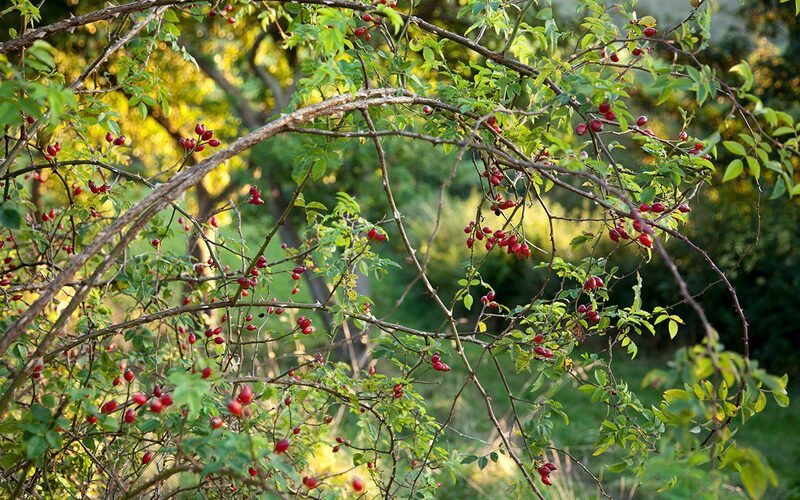 Blackthorn (Prunus spinosa) – or the Mother of the Woods – is a runner and it’s thorny cage quickly forms an impenetrable thicket. Over many years the centre dies out and, because the thorns are wicked (indeed, a wound from them can quickly turn septic, so best to wear leather gloves when pruning), the centre of the enclosure is somewhere that becomes free of predators. Acorns transported by rodents or ash keys blown into the protected eye will be the start of a slower and ultimately outcompeting layer that, in time, pushes the blackthorn out to the very edges of the hedge and out into the fields to claim more ground. 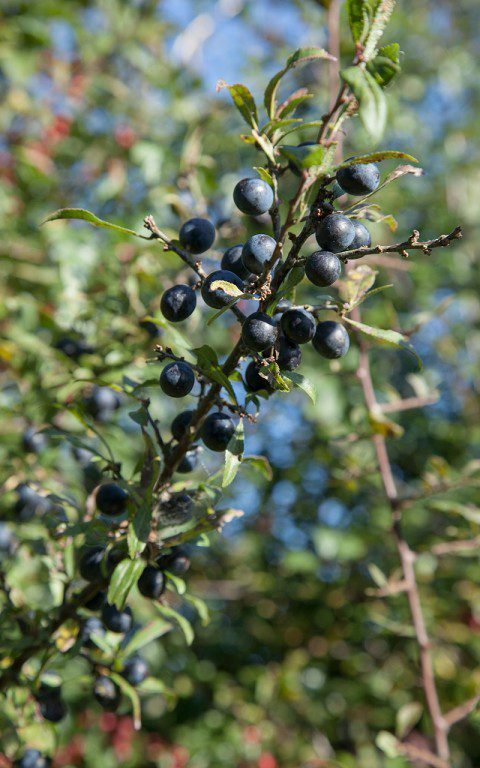 For this reason I have planted only a handful on the land, both for their early blossom and for the inky sloes that make a good addition to hedgerow jelly or for sloe gin, a favourite winter tipple. Now that we have been here long enough for my originally purchased whips to have yielded fruit, I have started to collect the berries before the birds have them all in order to grow my own plants from seed and so that I can continue to plug gaps with my home-grown material. The seedlings of the Viburnum opulus, the roses and the spindle have been added to the edges of the Blossom Wood as the trees have grown up and begun to shade the original shrubs I planted there as shelter. 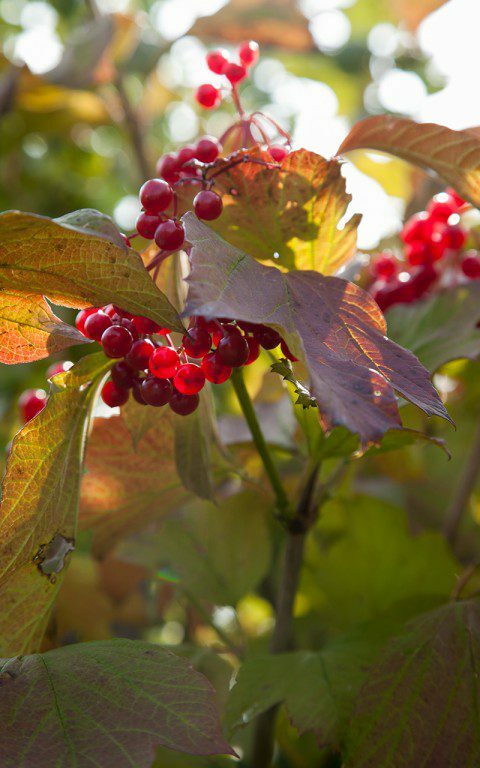 The viburnum is a particular favourite, the translucent, bright scarlet drupes lighting up wherever the plants have taken hold. The Eglantine roses have also been good to have to hand as their perfumed foliage is a delight on a damp morning when the smell of apples lingers on the still air. They have been planted by gates, into hedges that we walk past frequently and upwind of wherever there is a place we use that is downwind of them. 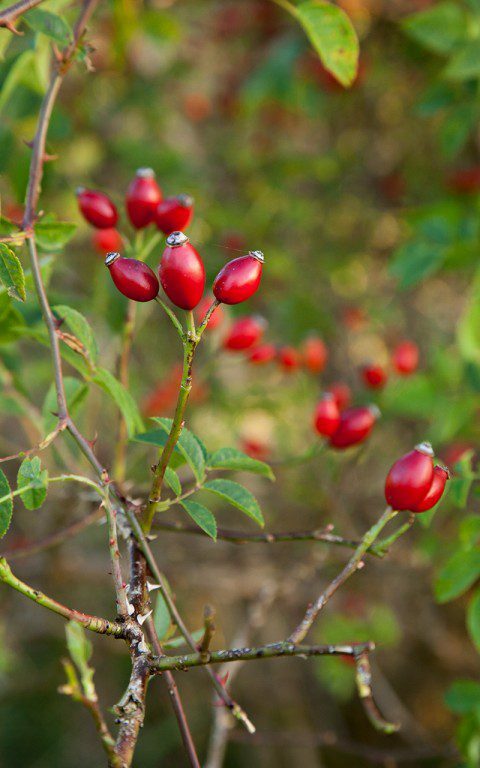 Interestingly – for deer generally target roses first of anything – the Eglantines have so far remained untouched. Is this just luck or is it the scented foliage that acts as a deterrent ? I have planted them by the entrance to the vegetable garden to see if they have the desired effect. 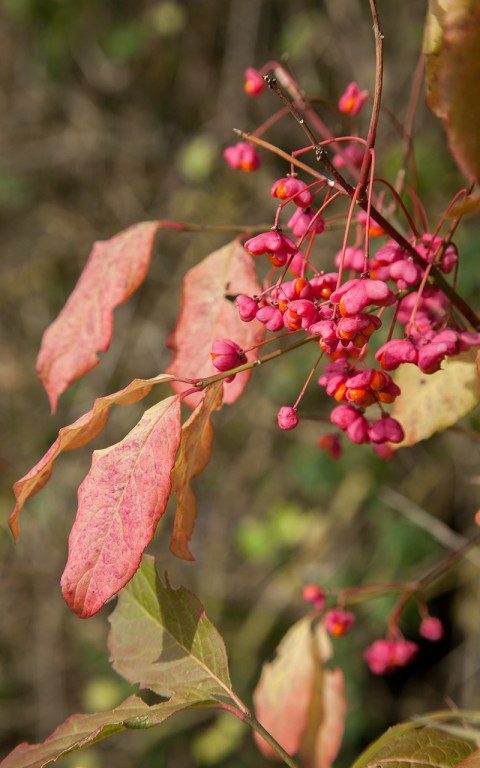 Our native spindle (Euonymus europaeus) is one of my favourite fruiting hedge plants. The pink turban-shaped fruits rupture in October to reveal the contrast of tangerine seeds suspended within. It is a dramatic combination and my original whips have shown that there are many different forms, some with fruits a brighter colour, others a paler pink but with more prolific fruit. Raising from seed is always interesting for this variation and I’ve selected the best for those that will make a link to the garden. 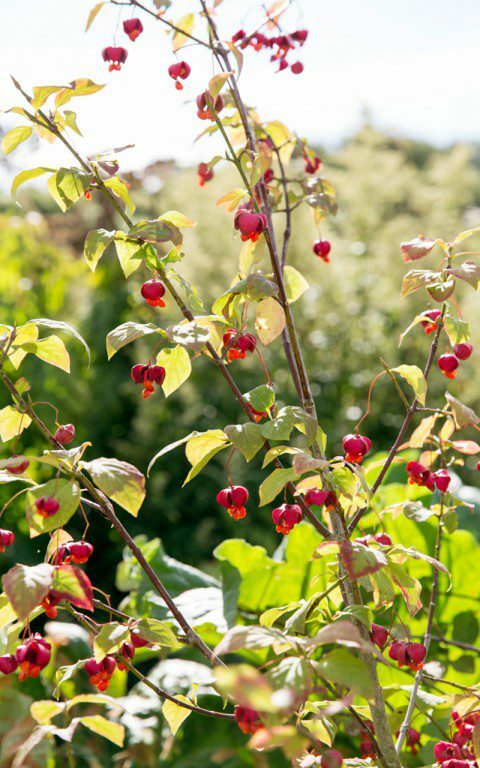 The garden is also going to be home to shrubs that fruit, such as Euonymus planipes, which will blend the ornamental into the land beyond it where things run wilder. 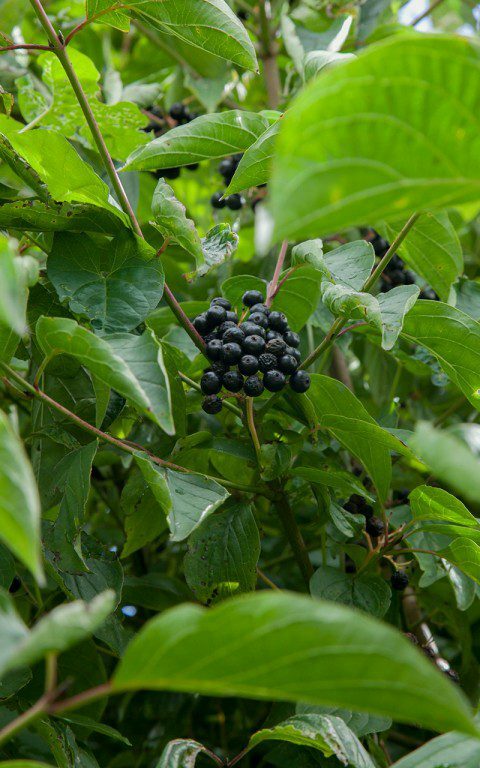 There is another story to be told here, but it is hard not to mention this wonderful shrub. I have two plants, both seed-raised, and they too are showing differences. The deep magenta fruits – more elegantly winged than the native – and vibrant orange seed hang in foliage that colours apricot and the colour of melted butter.